Rolling black outs and high electricity prices were a common ritual in Nicaragua a decade ago. Schools and shops often languished for hours without power. Hotels and restaurants relied on kerosene, candles and expensive generators to keep businesses open. From a financial and health perspective, this was not sustainable. 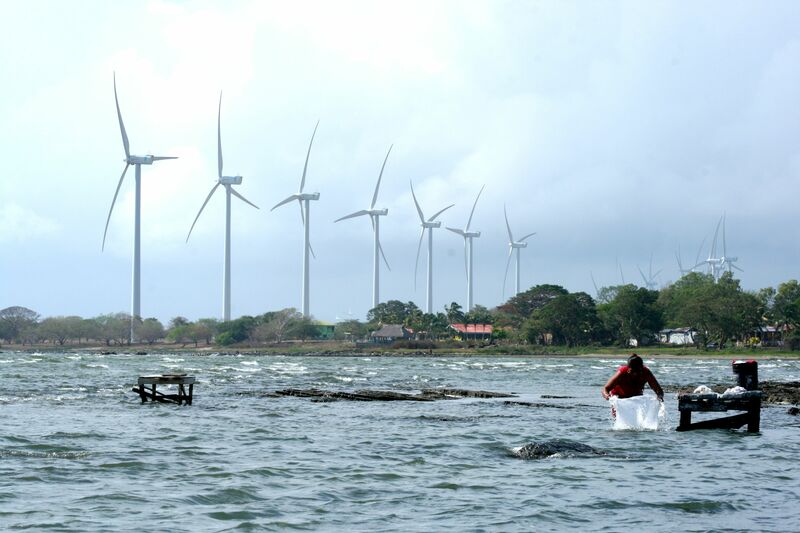 Recent renewable energy investments have led to positive change in Nicaragua. Almost 190 MW of wind energy have come online. And access to electricity now covers 4/5 of the country versus just over half at the turn of the century. Electricity outages still occur, but less frequently. However, the country is still hoping for positive change from an economic perspective. Electricity in Nicaragua costs roughly twice as much as it does in California. An innovative solution tested by early-stage company, NiuEra has helped Nicaragua confront this challenge. In order for Nicaragua to transition from an oil-based electrical grid to a cleaner and more reliable alternative, the most important first step was a thorough analysis of all the different scenarios out there. National Geographic provided a Great Energy Challenge grant for NiuEra to do just that. NiuEra incorporates smart analytics and cloud-based data and also develops new technologies and information systems at the household level, all with the purpose of contributing to a low-carbon transformation. NiuEra collaborates with the Renewable and Appropriate Energy Lab (RAEL) who developed an open access data and open source modeling tool, called SWITCH. Simply put, SWITCH is a sophisticated data approach employing dozens of pathways to help forge the best decisions about natural resource use. The goal is to help countries transition to a low carbon economy in the most reliable and least expensive way possible. NiuEra and RAEL partnered with Nicaragua’s National Engineering University, and used SWITCH to evaluate eight different pathways to a low-carbon grid from 2014 to 2030. A few examples of tested pathways included cheap fuel oil prices (US$50/bbl), geothermal mandates (25 percent total generation) and a base case (current development path). More details are available in a recently published paper in the journal Environmental Research Letters. 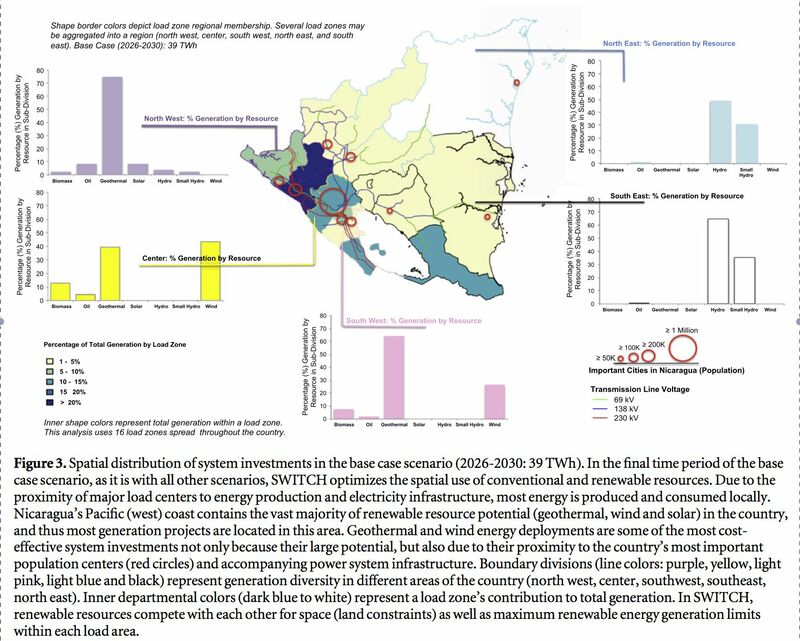 NiuEra’s promising conclusion found that the cheapest and most reliable way to expand Nicaragua’s electric grid by 2030 comes from an assortment of mostly (at least 80 percent) renewable energy technologies (excluding large hydroelectric dams). What’s more, results showed that regional cooperation between Honduras, Costa Rica and Nicaragua would lead to an even greater amount of wind (19 percent) and solar (3 percent) contribution to the grid by 2030 and at a lower cost (U.S. $127 MWh) than all other alternatives. With regional planning, renewable energy prediction is even greater and the gains often offset fossil fuel generation. Continental Europe, made up of 24 countries, is an example of this type of cooperation in practice. In the future, Brazil and Uruguay are likely to follow Europe’s lead. An inter-connected Central America would not only achieve climate and energy goals, but also optimize infrastructure planning. This would bring welcome change to a region that has seen more than its fair share of poorly planned energy projects. One such example is the proposed Tumarín megadam, which threatens to displace communities and damage local riparian ecosystems. Unlike other megadams, Tumarín will not have a reservoir, which is needed in order to balance intermittent renewables like wind and solar. Not to mention the lack of reservoir will leave the infrastructure highly vulnerable to recurring droughts. Indeed, a past drought significantly reduced hydroelectricity’s contribution to the electricity mix and the region was forced to purchase extra fuel oil to make up the difference. When is the best time to carry out an analysis like SWITCH? Early on in the energy planning process, and there are plenty of upcoming opportunities. Honduras will soon add over 80 MW of solar, Uruguay is increasing wind production to reach 30 percent of total energy generation and the United States has expressed financial interest in supporting Central America’s sustainable energy future. Why would a country transform their grid? The top reasons are energy security and energy independence, cost savings, reduced local air pollution and climate change. As it turns out, these issues are all growing in urgency, particularly in Central America as well as in other emerging economies. The Paris Climate Conference (COP21) wrapped up in December with climate pledge commitments from over 190 countries, each with an anticipated plan to transition to a low-carbon economy. Employing open source tools such as SWITCH and high-resolution energy datasets, along with appropriate technologies, is perhaps the most transparent and inexpensive way to facilitate such a transition. Beyond Nicaragua, Hawaii and also other places have incorporated the SWITCH model to facilitate longterm energy planning. In fact, SWITCH is being used to plan Hawaii’s transition to 100 percent renewables by 2045. Countries that submitted climate pledge commitments at COP21 stand to benefit greatly by following this example. This entry was posted in RanTs on February 26, 2016 by diegoleonbarido.